Welcome to Issue 6 of The Edge of Service. You are receiving this new newsletter as a friend or colleague, or because we've connected or interacted on service topics. If you choose, you can unsubscribe by clicking unsubscribe. Gazing into North Korea from Dora Observatory is a bit surreal. Open only to authorized tours (most coming from Seoul, two hours to the south), this is one of several frequented stops along the demilitarized zone (DMZ), along with an education center where you can enter a series of abandoned tunnels, and a rebuilt train station that once served points to the north. I had a free day before work commenced in Seoul (which included a keynote and workshop for APCCAL 2013, a fabulous customer service conference organized by Professor KJ Cheong and his team). Others in my tour group that day included a KLM pilot from Holland, a diabetes doctor from Shanghai, a group of students from France, and a family from Louisiana. We shared a common interest in wanting to better understand a conflict that never officially ended. From our vista, good weather enabled us to gaze far past a massive North Korean flag in the distance, to a smattering of roads, villages and industrial areas on the horizon. It was heartbreaking to contemplate the poverty, oppression and fear of those to the north (Kim Jong Un has since executed his uncle and, as of this writing, is sending hundreds of his extended family members to prison camps). It was impossible not to draw a contrast with the dynamism of South Korea, home of Samsung, Gangnam Style, and the most tech-connected society in the world (78% of the population uses smartphones). The DMZ tour was the last place I expected to get inspiration on vision. I hope you enjoy this issue. Best wishes for a great 2014! The rebuilding was a labor of love, with hopes that the rail line would once again reunite the North and the South. In 2007 and 2008, trains did, for a time, shuttle South Korean workers to and from the Kaesong Industrial Region just inside the North Korean border. But the experiment was discontinued by the North Korean government and no trains currently serve the North. Some see the eerily empty station as a symbolic reminder of an intractable separation between North Korea and its neighbors. But on a wall inside, there is a map that captures a powerful vision. 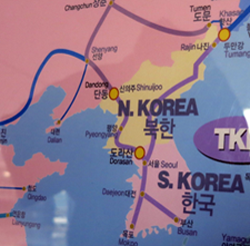 It illustrates a rail route that connects South Korea to Pyongyang, passing through North Korea to China, Russia, Mongolia, and beyond. 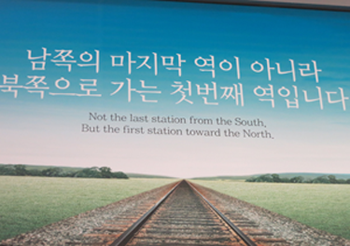 Our young Korean guide was matter-of-fact: "Someday, this station will be part of a system that connects North Korea, China, Russia, and even Eurorail." She added with a smile, "It will open up so much opportunity for so many." No one in my group doubted her. I suppose a printed map could have conveyed much the same concept. But we were standing in an embodiment of part of that future system. I believe that someday—I don't know when—the longing of so many who share her vision will come to fruition. 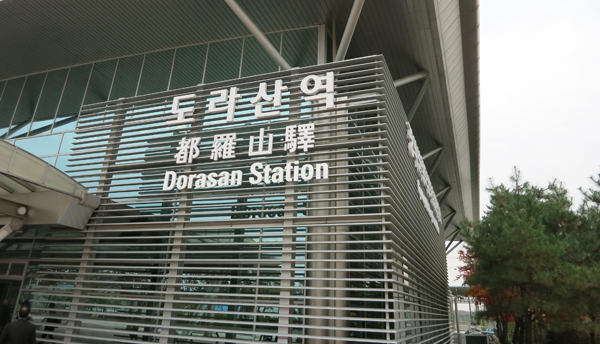 I'll leave it to you to decide whether rebuilding Dorasan Station was worth the time and cost. I do know this: it is powerfully uplifting and tangible to those who see it. It is an example of hands-on vision (granted, for a very difficult geopolitical situation). Two organizations I've worked with in the recent past spring to mind. One is large by any measure, yet nimble, customer-focused and consistently rated among the top companies for customer satisfaction. Their C-level leadership team had me deliver a half-day course to them—not 30 minutes, not a 90-minute executive briefing, but half-day interactive training on the basics of customer experience and engagement. Each person regularly invests time with agents, programmers, supervisors and customers. In stark contrast, another company that brought us in has a leadership team that from the VP level on up nary sets foot in their contact center or warehouse operations. Too busy with other things. Guess which of these organizations has lower turnover, more engaged employees, higher customer loyalty and better financial results? Guess which one spends far more time putting out fires? Whether you're VP of a division, senior VP of a multinational organization, or leader of a country, you've got to spend time on the ground. Too often, comments such as "I trust my team with that" and "I set direction but then get out of the way" are code for not being in touch. Choose your preferred example: Abraham Lincoln visited troops in the field, which he said profoundly impacted his decisions; the late Steve Jobs regularly dropped into Apple Stores; Vanguard founder John C. Bogle often handled customer contacts himself; Southwest's Herb Kelleher once famously said his strategic plan was "doing things." You likely won't need to build a train station. But it may be worth tinkering with your schedule so that you can spend more time with your programmers, call center agents, warehouse team, and customers. Organizations that capture data from customer interactions to identify opportunities for changes and improvements that boost customer satisfaction. Source: ICMI report, A Wow Customer Journey! Reflect on the time you've spent in the past year with customers, customer service agents, and others directly involved in the customer experience. What would the ideal look like in the coming year? KDPI-FM, January 6, 2013, local radio with Ellie Newman, "It's Relationship"
San Diego, February 3, 2014. One-Day Workshop, The Foundations for the Future Customer Experience Center, for the Execs in the Know Customer Response Summit. Orlando, March 4–7, 2014. Two–Day Workshop, Principles of Effective Contact Center Management, for ICMI. Miami, week of March 10. Customer interaction and customer experience for cruise reservations and customer care (time and title TBA). Video interview with Cornell University on changes in customer service. Article, ICMI, on 7 Steps to Reporting Contact Center Activity.